Boosts the likelihood of added effects appearing. Heightens the critical- hit ratios of moves. X The shell seems to be filled with joy. It is said that it will share good luck when treated kindly. X Seine Schale ist voll von Freude. Es teilt sein Glück, wenn man es freundlich und gut behandelt. X Sa coquille est remplie de joie. On dit que s’il est bien traité, il porte chance. X El cascarón parece estar lleno de alegría. Dicen que trae buena suerte si es tratado con cariño. X Il suo guscio sembra ricolmo di gioia. Si dice che porti fortuna se lo si tratta bene. X 껍질 안에 행복이 가득 차 있어서 상냥하게 대하면 행운을 나누어 준다고 한다. 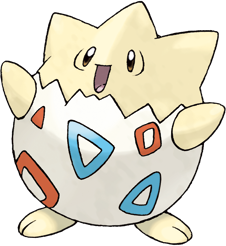 Y A proverb claims that happiness will come to anyone who can make a sleeping Togepi stand up. Y Ein Sprichwort besagt, dass Glück dem widerfährt, dem es gelingt, ein schlafendes Togepi zu wecken. Y Un proverbe nous enseigne que le bonheur touchera celui qui peut faire tenir debout un Togepi endormi. Y Dice el proverbio que quien despierte a un Togepi de su sueño, alcanzará la felicidad. Y Un proverbio dice che chi riuscirà a far alzare un Togepi dormiente sarà baciato dalla fortuna. Y 자고 있는 토게피를 잘 세울 수 있다면 행복해질 수 있다는 이야기가 전해진다. 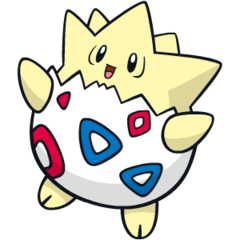 Omega Ruby As its energy, Togepi uses the positive emotions of compassion and pleasure exuded by people and Pokémon. This Pokémon stores up feelings of happiness inside its shell, then shares them with others. Omega Ruby Togepi benutzt die positiven Emotionen Freude und Mitgefühl von Menschen und Pokémon als Energie. Dieses Pokémon speichert Glücksgefühle in seiner Schale und teilt sie mit anderen. Omega Ruby L’énergie de Togepi provient des émotions positives et du plaisir exprimé par les gens et les Pokémon. Ce Pokémon accumule les sentiments de bonheur dans sa coquille, puis les partage avec les autres. Omega Ruby Togepi usa los sentimientos positivos de compasión y alegría que desprenden las personas y los Pokémon. Este Pokémon almacena sentimientos de felicidad en su interior y después los comparte con otros. Omega Ruby Togepi ricava la sua energia dai nobili sentimenti di affetto e generosità emanati dai Pokémon e dall’uomo. Togepi immagazzina le sensazioni di felicità dentro il suo guscio e le divide con gli altri. Omega Ruby 사람이나 포켓몬이 발산하는 상냥함이나 즐거운 마음을 에너지로 삼는다. 껍질 안에 모은 행복을 나눈다. Alpha Sapphire As its energy, Togepi uses the positive emotions of compassion and pleasure exuded by people and Pokémon. This Pokémon stores up feelings of happiness inside its shell, then shares them with others. Alpha Sapphire Togepi nutzt die positiven Emotionen, wie Freude und Mitgefühl, von Menschen und Pokémon als Energie. Dieses Pokémon speichert Glücksgefühle in seiner Schale und teilt sie mit anderen. Alpha Sapphire L’énergie de Togepi provient des émotions positives et du plaisir exprimé par les gens et les Pokémon. Ce Pokémon accumule les sentiments de bonheur dans sa coquille, puis les partage avec les autres. Alpha Sapphire Togepi usa los sentimientos positivos de compasión y alegría que desprenden las personas y los Pokémon. Este Pokémon almacena sentimientos de felicidad en su interior y después los comparte con otros. Alpha Sapphire Togepi ricava la sua energia dai nobili sentimenti di affetto e generosità emanati dai Pokémon e dall’uomo. Togepi immagazzina le sensazioni di felicità dentro il suo guscio e le divide con gli altri. Alpha Sapphire 사람이나 포켓몬이 발산하는 상냥함이나 즐거운 마음을 에너지로 삼는다. 껍질 안에 모은 행복을 나눈다. Gold The shell seems to be filled with joy. It is said that it will share good luck when treated kindly. Silver A proverb claims that happiness will come to anyone who can make a sleeping Togepi stand up. Stadium2 The shell seems to be filled with joy. It is said that it will share good luck when treated kindly. Ruby As its energy, Togepi uses the positive emotions of compassion and pleasure exuded by people and Pokemon. This Pokemon stores up feelings of happiness inside its shell, then shares them with others. Sapphire As its energy, TOGEPI uses the positive emotions of compassion and pleasure exuded by people and POKeMON. This POKeMON stores up feelings of happiness inside its shell, then shares them with others. FireRed A proverb claims that happiness will come to anyone who can make a sleeping TOGEPI stand up. LeafGreen The shell seems to be filled with joy. It is said that it will share good luck when treated kindly. Emerald As its energy, it uses the feelings of compassion and pleasure exuded by people and POKeMON. It stores up happy feelings in its shell, then shares them out. Diamond Its shell is said to be stuffed with happiness that it shares with kindhearted people. Pearl Its shell is said to be stuffed with happiness that it shares with kindhearted people. Platinum It transforms the kindness and joy of others into happiness, which it stores in its shell. HeartGold The shell seems to be filled with joy. It is said that it will share good luck when treated kindly. SoulSilver A proverb claims that happiness will come to anyone who can make a sleeping TOGEPI stand up. Black It transforms the kindness and joy of others into happiness, which it stores in its shell. White It transforms the kindness and joy of others into happiness, which it stores in its shell. Black 2 It transforms the kindness and joy of others into happiness, which it stores in its shell. White 2 It transforms the kindness and joy of others into happiness, which it stores in its shell.